1.3641 support level located in the beginning of the secondary correction to be started. There is good correlation with Brent Crude Oil chart so if USD/CAD is continuing with the bullish trend so we may see Brent Oil daily price to be reversed to the primary bearish condition. "The bid in Crude Oil over the last few sessions has been welcomed news for CAD longs, which benefit when USD/CAD falls. However, the news out of the energy market may not stay supportive for long. On Thursday, OPEC raised their 2017 estimate of supply growth from non-OPEC producers (i.e., US Shale) by 46%, which is a direct threat to the supply curbs put in place by OPEC and Russia and expected to be extended to help rebalance the market. While there has been a bounce in Crude Oil over the last few sessions, hopeful bulls should be reminded we traded at 5-month lows last week, and we continue to get information showing that global demand may be falling, not rising as total supply is not falling as much as originally planned. " "Despite the recent concerns, USD/CAD has yet to trade above the May 5 and 2017 high of 1.3793. However, the recent volatile price action and discouraging undertones for drivers of CAD value may favor further CAD weakness and USD/CAD upside. The short-term zone of support for the uptrend is 1.3598 (December 28 high) and 1.3875 (38.2% retracement of the April-May range.) Should the price continue to close above this zone on a daily basis, the current sideways price action is preferred to be seen as a precursor before a move to new 2017 highs and toward the long-term target of 1.3838 (61.8% Fibonacci retracement of the 2016 range.)" 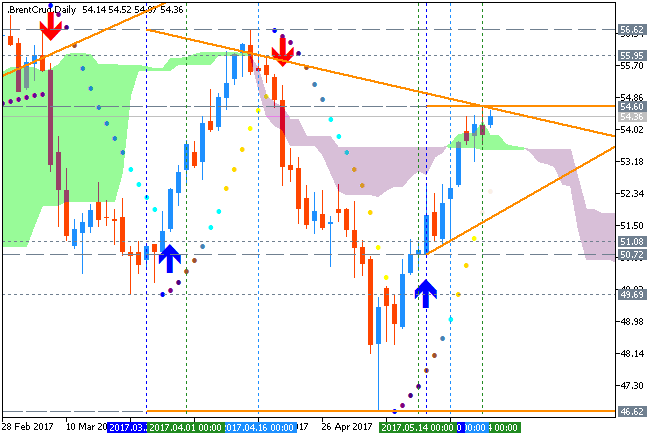 Daily price went to the bullish territory by breaking Ichimoku cloud to above: price is testing 54.60 resistance level for the bullish trend to be continuing with 55.95/56.62 nearest bullish targets. The other scenario is the following: the price will be bounced from one of the resistance level to below back to the bearish area of the chart for the ranging within the levels for direction. "Under this triangle scenario, prices would need to top soon and below $55.21. If a short term pivot forms, we would anticipate one last dip to hold above $43.79 to finish off the triangle pattern. This is an overall bullish pattern that would lead to a break higher. This triangle is valid in the near term so long as crude oil prices are contained between $43.79 and $55.21." "Under this scenario, the dip to $43.79 was wave four of the five wave diagonal. This sequence implies crude oil prices have begun their ending wave higher. This final wave likely grabs a new high above $57 while holding the green support trend line." Every investor has seen the odd phenomena of stocks going down when there is good news about the stock or conversely stocks going up when there is bad news about the stock. Is there a system that can be used to help analyze these trends and to be able to then predict stock trends? The answer is yes, and one possibility is Elliot Wave Theory. Elliot Wave Theory examines how groups of individuals react en masses to things in their environment and the psychological reasons for such reactions. Elliot Wave Theory then groups those reactions into predictable patterns or ‘waves. Once you have identified a particular trigger, you can then predict the coming waves and how groups will behave in accordance to those waves. The key component of Elliot Wave Theory are the Elliot Waves themselves. Several mini Elliot Waves will make up one bigger wave. The bigger wave is known as a fractal. 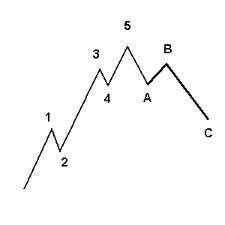 Fractals can then be grouped together to create an even larger wave showing a complete trend based one trigger. The stock market is an excellent vehicle to use Elliot Wave Theory to analyze potential market trends. Once a potential trigger has been identified, the potential movement of the stock can be predicted by the applying the Elliot Wave principles. Opportunities for solid Elliot Wave Predictions exist whether the stock is moving in an upwards or downwards trend as Elliot Wave Theory accounts for upwards and downwards movement. Elliot Wave Theory can be applied to anything that is traded, including gold. Elliot Wave Gold systems can provide an opportunity for excellent growth. The key of course is being able to identify a trigger, understand that triggers implications, and then predict how groups of investors will react. That’s where solid, proven Elliot Wave Theory application can give you an edge in your invested strategies. 50.69 support level located below100 SMA/200 SMA in the primary bearish area of the chart. 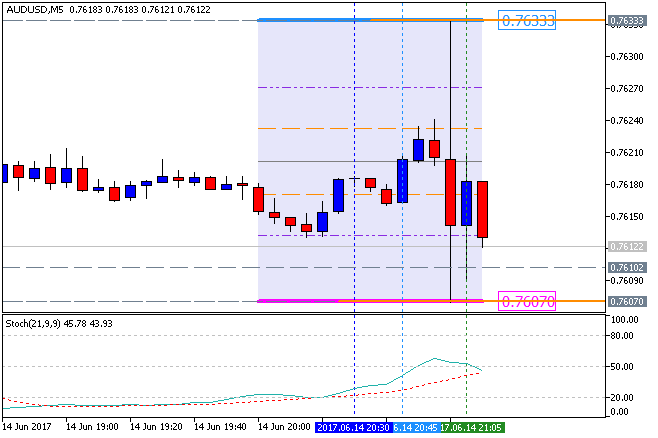 RSI indicator is estimating the daily bearish trend to be started. If the daily price breaks 54.64 resistance level to above on close bar so the price will be reversed back to the primary bullish market condition. 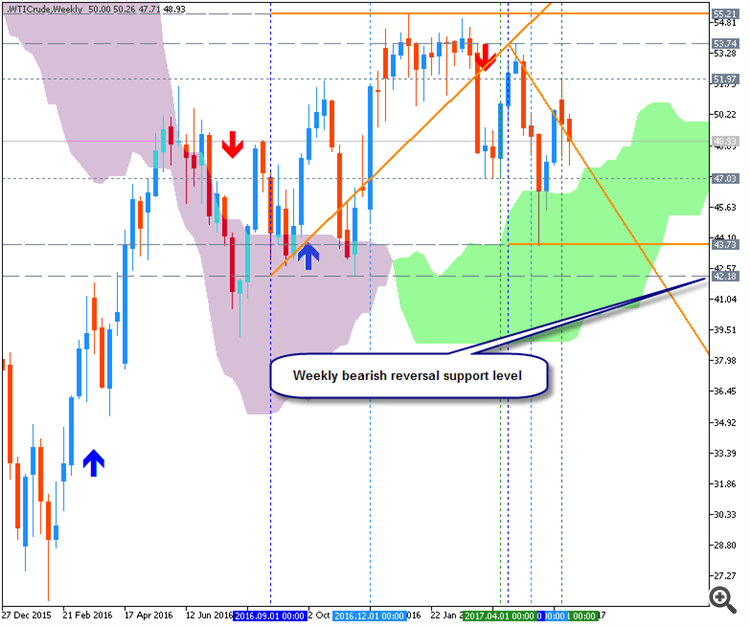 If daily price breaks 50.69 support to below on close bar so the primary bearish market condition will be continuing. If not so the price will be ranging within the levels waiting for the strong bearish/bullish direction. The Medium-Term Strategy: watch close price to break 50.69 support level on close daily candle for possible sell trade. 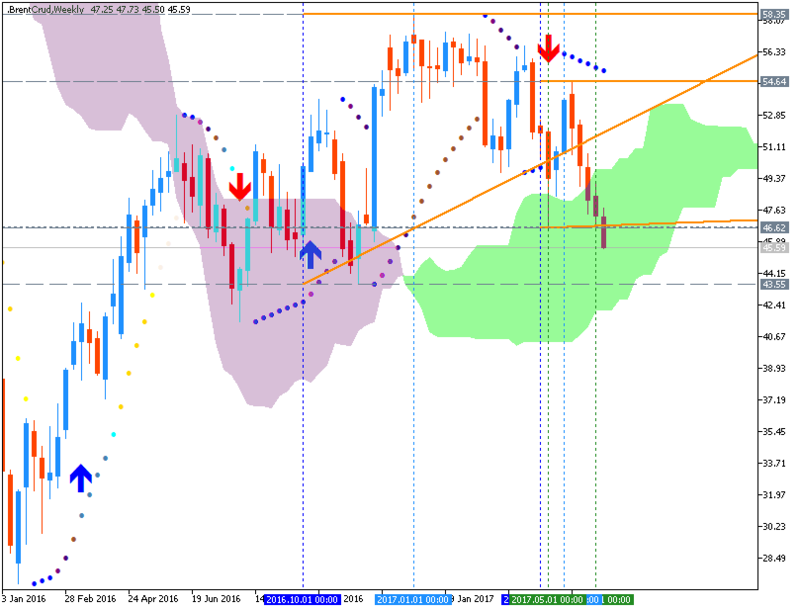 Weekly price for Crude Oil is located above Ichimoku cloud in the bullish area of the chart. The price is ranging within 58.35 resistance level and 46.62 support level with the descending pattern tpo be formed for the price to be crossed 46.62 and with 43.55 bearish reversal support level. "For the past couple years, crude oil has been chopping around in the $30 to $60 trading range as traders parse conflicting factors such as the persistent oil glut, OPEC production cuts, rebounding U.S. shale oil production, and the vagaries of the U.S. dollar. This phenomenon of low volatility is not isolated to crude oil - it's the same story throughout the global financial markets." "Like WTI crude oil, Brent crude oil is trading in a range between $30 and $60 per barrel, with $40 being another important long-term support level to be mindful of. A decisive breakout from this range is necessary to confirm the next major crude oil trend." 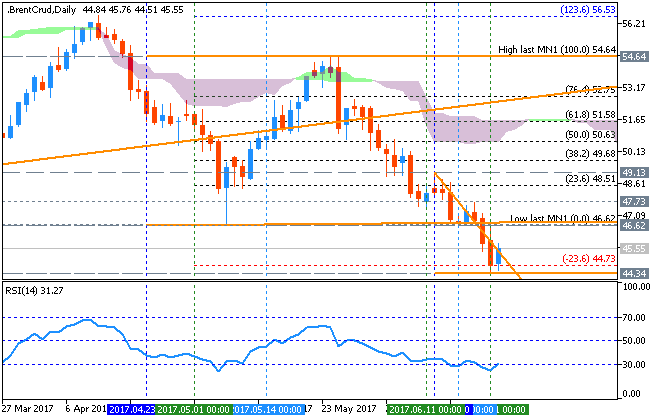 WTI weekly price is near and above Ichimoku cloud for the ranging within 55.21 bullish continuation resistance and 43.73 support level. Bearish descending pattern was formed by the price to be crossed to below for 42.18 bearish reversal support level as a target. 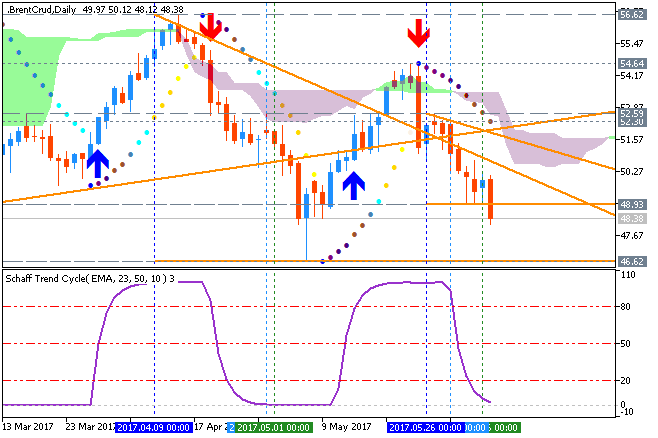 "West Texas Intermediate (WTI) crude oil has been trading in a clear range between $30 and $60 per barrel, with $40/barrel being an important support level as well. WTI crude oil needs to break out of this range (in one direction or another) in a convincing manner in order to signal the start of the next major trend. Until then, expect volatility to continue falling as long as WTI crude is stuck in this range." "The monthly WTI crude oil chart shows the importance of the $40 support level that I've been discussing for a while. Commercial crude oil hedgers or the "smart money" have maintained a short position in crude oil over the past several years, but have recently been paring back as crude fell. It's hard to get excited about a bottom in crude oil until the "smart money" cover most of their short position (get back to neutral)." [USD - Crude Oil Inventories] = Change in the number of barrels of crude oil held in inventory by commercial firms during the past week. "U.S. commercial crude oil inventories (excluding those in the Strategic Petroleum Reserve) increased by 3.3 million barrels from the previous week." 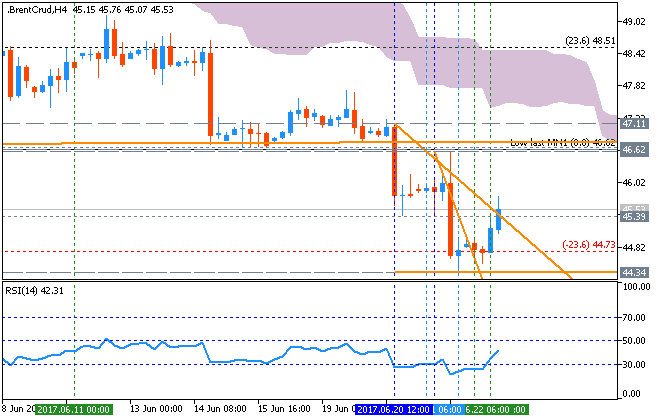 Crude Oil M5: bearish breakdown. 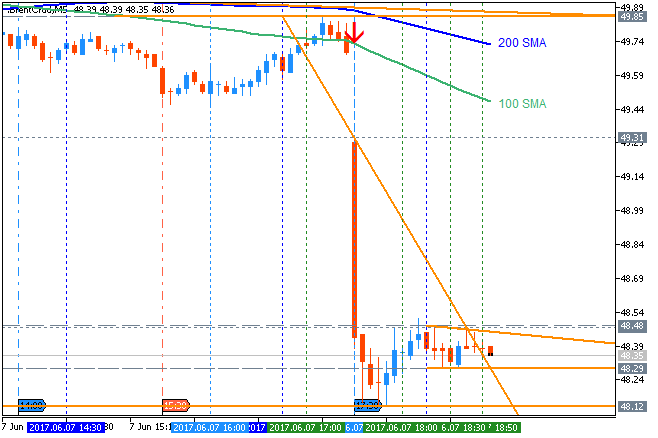 The price was bounced from 100 SMA/200 SMA to below for good bearish breakdown. The descending triangle pattern was formed by the price together with 48.12 support level to be crossed to below for the bearish trend to be continuing. 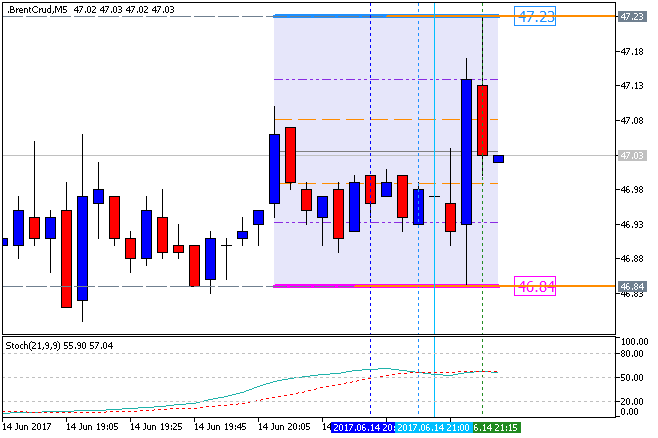 If the price breaks 49.85 resistance level to above on M5 close bar so the bullish reversal will be started. If the price breaks 48.12 support so the bearish trend will be resumed. If not so the price will be on bearish ranging within the levels. Crude Oil Daily: bearish breakdown. 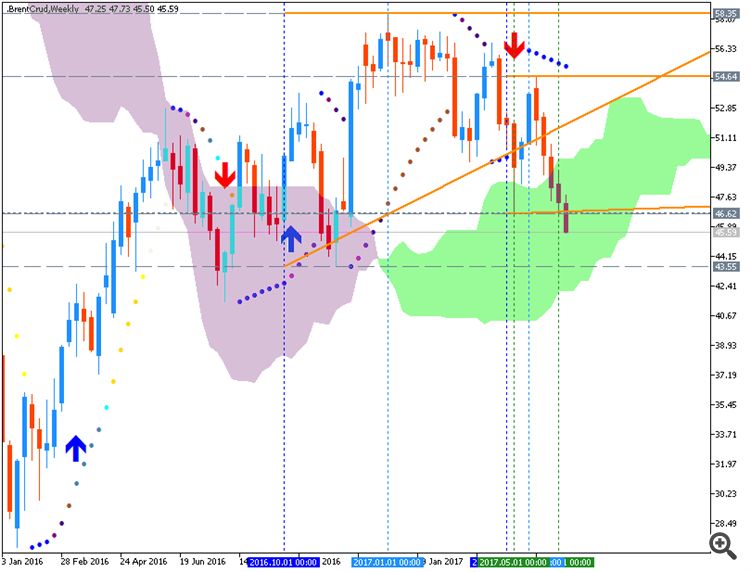 The price was bounced from 54.64 resistance and Ichimoku cloud to below for the daily bearish reversal with good breakdown by crossing descending triangle pattern to below together 48.93 support level and with 48.12 support as the nearest bearish target to re-enter. 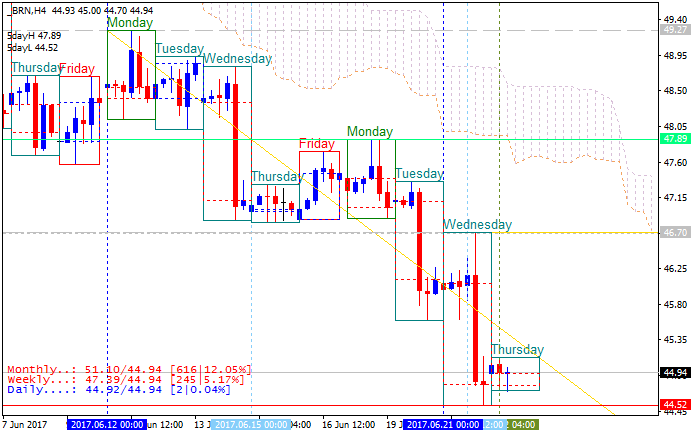 If the daily price breaks 52.59 resistance on close bar so the reversal of the daily price movement from the primary bearish to the primary bullish market condition will be started with 54.64 daily bullish target to re-enter. 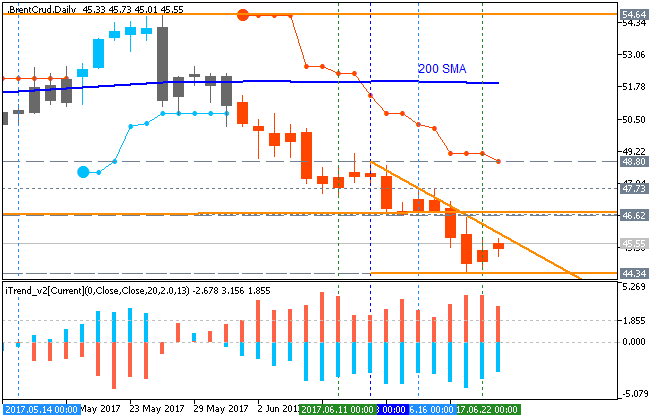 If the price breaks 48.12 support level to below on close daily bar so the bearish trend will be continuing with 46.62 daily target. [USD - Federal Funds Rate] = Interest rate at which depository institutions lend balances held at the Federal Reserve to other depository institutions overnight. "In view of realized and expected labor market conditions and inflation, the Committee decided to raise the target range for the federal funds rate to 1 to 1-1/4 percent. The stance of monetary policy remains accommodative, thereby supporting some further strengthening in labor market conditions and a sustained return to 2 percent inflation." "In determining the timing and size of future adjustments to the target range for the federal funds rate, the Committee will assess realized and expected economic conditions relative to its objectives of maximum employment and 2 percent inflation. This assessment will take into account a wide range of information, including measures of labor market conditions, indicators of inflation pressures and inflation expectations, and readings on financial and international developments. The Committee will carefully monitor actual and expected inflation developments relative to its symmetric inflation goal. The Committee expects that economic conditions will evolve in a manner that will warrant gradual increases in the federal funds rate; the federal funds rate is likely to remain, for some time, below levels that are expected to prevail in the longer run. However, the actual path of the federal funds rate will depend on the economic outlook as informed by incoming data." 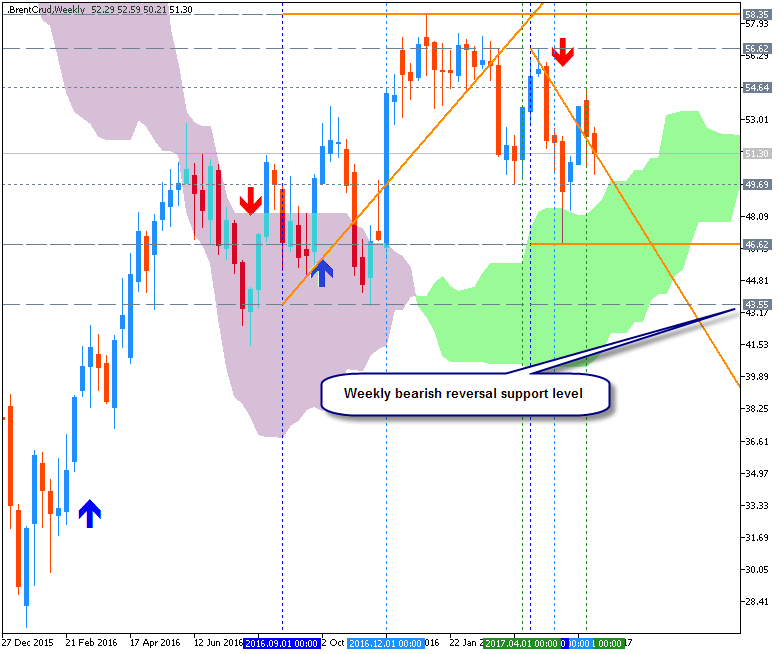 43.55 support level located near and below Ichimoku cloud in the beginning of the weekly bearish reversal to be started. If weekly price breaks 54.64 resistance level to above on close bar so the primary bullish trend will be resumed. If weekly price breaks 43.55 support to below on close bar so the primary bearish reversal will be started. 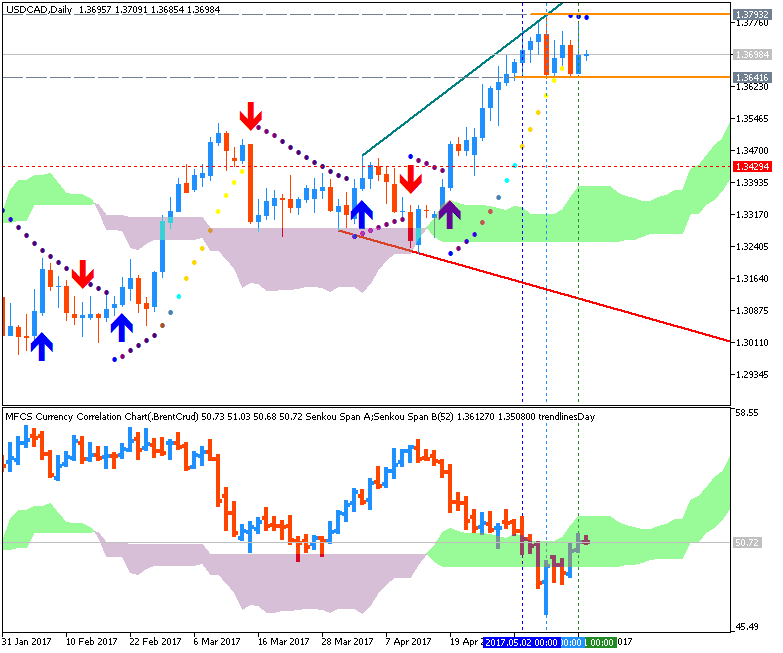 H4 price is on bearish market condition located below Ichimoku cloud. If the price breaks 44.52 support level to below so the primary bearish trend will be continuing, otherwise - bearish ranging within the levels. "Oil prices officially re-entered a bear market on Tuesday (defined by a decline of -20% below a recent high) as global demand remains tepid and supply remains stubbornly high. Economics 101 tells us that commodity prices are a function of supply and demand. All things being equal, prices go up when demand is strong and supply is stable or low. Conversely, prices fall when demand is low and supply is high. Since the 2008 crash, oil prices have never fully recovered because global demand has remained weak and supply continues to grow." "Harry E. Morad, Managing Partner Pine Valley Investments, said, "It would be fair to argue that credit risk is being discounted within the high yield markets. If energy prices continue to fall, then years of asset managers aggressively seeking out yield may be the catalyst for a short term selloff, or worse, a sustained bear market. However, protecting downside exposure with a put strategy is a cost effective way to stay invested in a resilient market that may shrug off yet another risk." Price is still below Ichimoku cloud in the bearish trend area, and new key support level for the bearish trend to be resumed is 44.34. As we see from the image below - descending triangle pattern was formed by the price to be crossed to below for the bearish trend continuation. The bullish reversal resistance levels are 46.62 and 47.11 so if the price breaks those levels (and especially 47.11 level) to above on close H4 bar - the intra-day bullish reversal will be started. By the way, if we look at the daily chart so we can see same key support level for the bearish trend to be resumed: 44.34. And the bullish reversal resistance level is 51.65 for the reversal to be started and 54.64 for the price to be fully reversed to the primary bullish market condition. 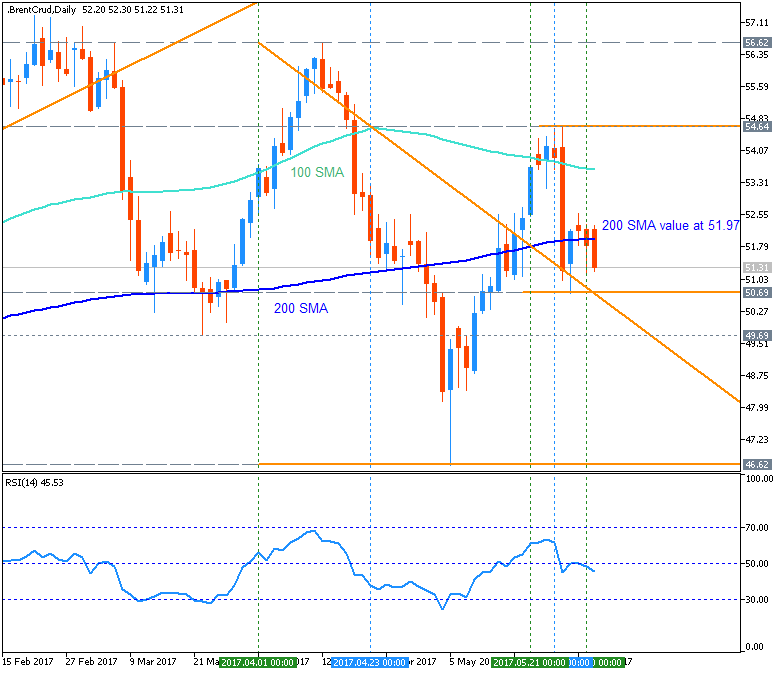 Daily price is below 200 SMA in the bullish area for the ranging within 44.34 support and 46.62 resistance. Breaking 44.34 level to below will lead to the bearish trend to be continuing, and if the price crosses 46.62 resistance to above so the secondary bear market rally will be started with47.73/48.80 nearesttarget to re-enter. "The optimism that permeated the commodity markets due to OPEC’s resolve to rebalance the oversupplied oil markets has now turned into some pessimism. After moving past the $55-per-barrel mark for the first in the last 20 months in February of this year, crude oil prices have plunged back to under $45 per barrel of late. This collapse is largely driven the rise in U.S. oil production and inventories, as the sudden recovery in oil prices made it economically viable for U.S. shale producers to expand their output. Additionally, the global rig count, more specifically the North American rig count, has been expanding sharply, indicating that the U.S. oil output is likely to swell even further in the forthcoming months. Further, per the latest data, the OPEC members, particularly Nigeria, Libya, and Iraq, have ramped up their output in the last month, raising questions about the effectiveness of the oil cartel’s production quotas. This could imply that despite the OPEC’s efforts to curb its oil supply, and in turn, stabilize oil prices, the oil prices are likely to remain depressed over the short term." "One of the positive outcomes of the ongoing commodity slump has been the reduction in the operating costs of most U.S. shale producers. While a dozen of these companies have been pushed out of the market in the last two years, a few of them, such as EOG Resources and ConocoPhillips - who have continued to optimize their cost structures and invest in innovative technologies to enhance their operational and capital efficiency - have managed to bring down their break-even oil price from over $80 per barrel in 2014 to under $40 per barrel at present. This has motivated independent oil and gas producers, such as Chesapeake and Anadarko Petroluem, to build extensive plans to grow their production by 10%-15% annually over the remaining years of this decade."